The next working day at the panel is Saturday 4 February, where we will continue (and hopefully finish) the threading-in of the 8-core cables that will connect the PCBs to the tag blocks. Please note that due to a change in DRC policy, the building is without mains electricity at present. This, unfortunately, means no heating is available, so please wear your coat! Each year we review our documentation for working members. We also renew work permits (red cards) each year. The briefing booklet for volunteers has been considerably updated. It contains all the necessary information required for safe and happy volunteering with Swindon Panel Society and will help ensure your safety and the safety of those around you as much as we can. This applies to all activities undertaken with SPS, not just on the DRC site. All working members will be given with a copy of this new booklet on the first occasion you volunteer with us in 2017. At the same time we will ask you to complete an acknowledgement/emergency details form and we will renew your red card for 2017. Links are provided here for anyone who wishes to download/read/print at home (printed copies will be at the panel). We also review the Risk Assessment for the work we do annually, so this has also been updated. As you will be aware, our Swindon Panel gathering of past and present signalmen and friends is taking place in just under eight weeks (read more details). We are keen to invite as many former signalmen and staff from Swindon Panel as we can, so if you are in contact with anyone with a connection with Swindon Panel in the past, in any capacity, official or unofficial, please either let us know about their contact details or let them know about the event! We wish all our members, supports and friends a very happy Christmas, and look forward to seeing you all at the panel in 2017. Volunteers are essential to Swindon Panel. Without you we wouldn’t have been able to achieve what we have. In recognition of the importance of its volunteers, we are delighted to announce that the Society has been granted £6,000 by the Big Lottery Fund to help us to develop volunteering! This will help provide resources to help us to find new volunteers and also make it easier for people to participate. It will also be used to provide skills development for our existing volunteers. Looking ahead, we will soon be guiding visitors round our unique exhibit and need to ensure the maximum educational and enjoyment value – the grant will be useful in developing our presentation skills here too. Look out for more news on this exciting development in the near future! Very many thanks to Tim who has lead this process from the very beginning and everyone who has helped along the way! Swindon Panel Newsletter 15 is now on its way to silver and gold members. If you’re not in line to receive a copy, but would like to, join SPS now! SPS held visits to several signal boxes in the formative years of the Society, but we did not hold any in 2016 while we were occupied with heavy work on Swindon Panel. We are delighted to resurrect our interest in visiting signal boxes with this SPS visit to Romsey Signal Box on 15 January 2017. Everyone is welcome to join us on what promises to be a fascinating day! Our Activities Calendar for 2017 has now been published. We have continued with our pattern of working every other weekend on the panel restoration, additional dates will be added if the volunteer manpower permits. Saturday 7 and Sunday 8 January we will be attending the Kidlington Model Railway Show, Exeter Hall, Kidlington. Saturday 18 February we will be attending the Kenavon Model Railway Show in Reading. We would be delighted to receive any offers of help with manning the Swindon Panel trade stand at these shows. No special skills are required, it’s all about giving out leaflets, talking to passers-by, and sharing the news of our work. Don’t worry, you won’t be alone! It’s a great opportunity to help Swindon Panel and also visit the rest of the show yourself. Please let us know if you are free on any of those days and available to help out. Saturday 11 March we are delighted to be hosting a second ‘Swindon Panel & Friends’ Reunion & Dinner, a repeat of our successful gathering event in April 2015. More details…. Saturday 3 June will be our AGM – always a popular opportunity for everyone to catch up and review the year of progress. There are some other activities we hope to add in soon too – such as a trip to Romsey Signal Box, a very successful signal box preservation project with similar aims to ours which we hope we will be visiting in the spring, and the popular “Work Week” in August. We hope to see you at Didcot in 2017! We are starting to plan our 2017 event calendar, and there are already some ‘dates for your diary’ on it! We are delighted have re-printed two small books that were issued by Western Region to signalmen and others at the time of the Swindon MAS scheme in 1968 explaining in great detail the operation of the new panel. As far as SPS has been able to establish no custom book was made for Swindon, but instead the standard Western Region book issued, plus a Swindon Appendix that contained the local information. Both of these have been re-printed by SPS. The Western Region book is 44 pages long and the Swindon Appendix is 16 pages. The books are produced in matching style and are available separately (£8 and £3 respectively) or at a discount if purchased together (£10). The books are available to buy online now, via HOPS. 100% of the price you pay will be used in the preservation of Swindon Panel at Didcot Railway Centre by Swindon Panel Society, registered charity 1159646. UK postage is free (sponsored by HOPS). HOPS does not make any of the money from the sale of these products. Swindon Panel souvenirs help restore Swindon Panel! Another milestone passed today in the building! Plaster on some of the walls was dry enough that we could put the first coat of paint on. The paint had to be watered down as it was being applied to bare plaster but it already makes the place look brighter. Thanks to Stephen and John for helping. The Bristol Group were also working today on the wooden signal post. More activities including painting walls taking place tomorrow (16th), and a week tomorrow (23rd), plus the continuation of soldering and wiring in the back of the panel. Join us! One way in which Swindon Panel is raising much needed funds is through the sale of Swindon Panel souvenirs. Are there any gaps in your collection of Swindon Panel memorabilia…? Some blue ones still available and lots of new green ones. £5 each. UK P&P free. Swindon Panel enamel totem fridge magnet. A must for any self-respecting fridge. 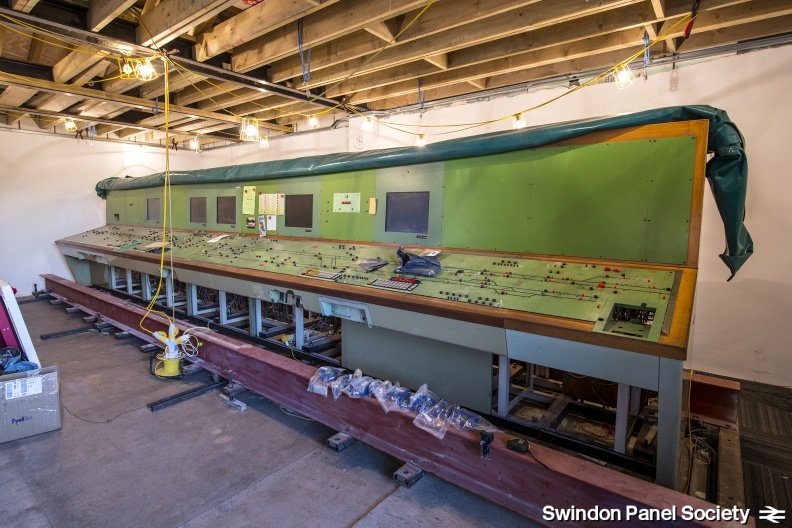 The story of the preservation of the panel and its move to Didcot. We have a small number of these badges left which we released earlier in the year to celebrate Swindon Panel’s 48th birthday and its transition into preservation. Swindon Panel celebratory pin badge set. £2 each or a complete set of 6 for £10. UK P&P free (only full sets available by post). Thanks to some superb work by the GWS Civil Engineering (CE) Group, the building now has a complete set of windows in the three back windows of the building (one in the Swindon room and two in the Bristol room). These are original GWR windows from the former buildings at the front of Didcot station before the pickup area was built. The last remaining window, at the front of the building, is from Taunton Engine Shed. 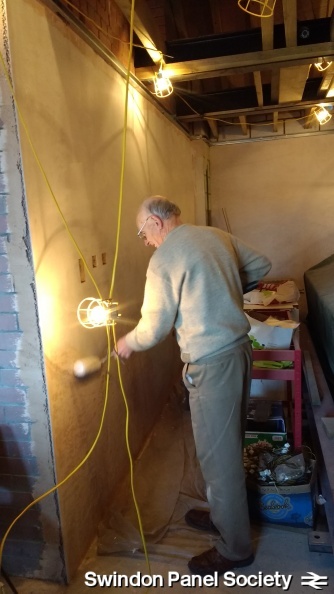 Plastering has now taken place on two of the walls in the Swindon room, that’s the wall at the Uffington end of the panel, and the wall that’s face-to-face with the Uffington part of the panel. Tomorrow, and Thursday next week, the wall behind the panel will be plastered. The Uffington end wall has already received a first coat of paint. 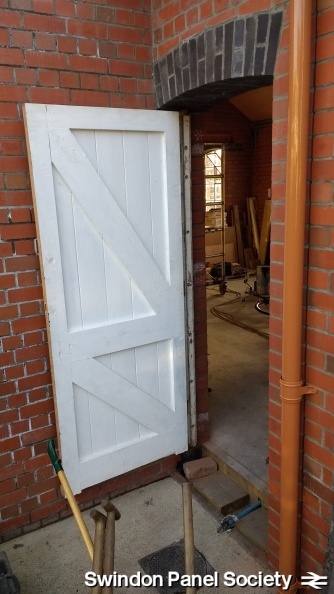 The first of the final doors have been fitted to the building now, the small door at the side of the building now has a “new” wooden door (actually a recovered railway door). The doors for the signal building have been rescued from the p.w. buildings at Didcot and platform 9 at Reading. 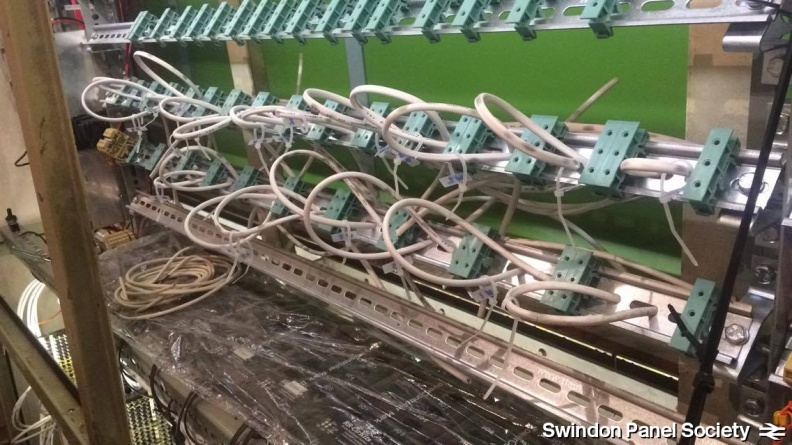 Well done and thank you to our army of solderers who are building the PCBs for Swindon Panel’s simulator. The administration of picking, packing, sending, receiving and dealing with the hundreds of PCBs involved has been a lot more difficult that I thought it would be – so I apologise that the process is going very slowly indeed and that I am the weakest link! Boards are flowing out and back in thick and fast. All will be tested for electronic functionality shortly and then we’ll start to install them in the panel! As you will have seen in the AGM reports and in the newsletter, the Society needs to raise some new funds. * £25k building contribution (£20k already paid, remainder due in Summer 2017). * £5k panel move costs (all paid). * £7k simulator electronics cost (~£6k paid). * ~£3k building internal decorating costs (not yet started). From this very simple breakdown, you can see there is approximately £6,000 of major expenditure expected in the next 12 months, plus other costs such as insurance, tools, etc, so realistically we’ll be spending a minimum of £8,000 in the next 12 months. We recently made £1,500 of unplanned expenditure on security (CCTV and boarding-up), and left in the bank there is now £1,200. We have been very lucky in the past that we haven’t had too much difficulty raising money. The several delays to the closure of the panel by Network Rail helped this. But now we are in the situation, for the first time, where we don’t have enough money in the bank to carry us through our expenditure commitments. We have therefore set ourselves the necessary challenge of raising the required £6,800 over the next 8 months (which is the time by which it is required). Nearly a thousand pounds a month is a tall order, so we need your help! There are many ways you can help, such as making a donation (either via that link, or cheque via post, or cash in person), sponsoring an item from our Amazon Wish List, becoming a member of the Society, upgrading your membership if you are a bronze member, signing up to Easy Fundraising, completing a Gift Aid declaration, purchasing one or more of our Swindon Panel souvenirs or newsletter binders, and helping to spread the word about the Society and its work via Facebook, Twitter, YouTube and this website. The panel is now in Didcot, fully in our possession, and it’s no longer a question of ‘if’ it’s preserved and brought back to life, it’s ‘when’! The ‘when’ currently depends on fundraising, so if you’ve followed our progress with interest thus far, please consider helping the preservation in one of the many ways above. 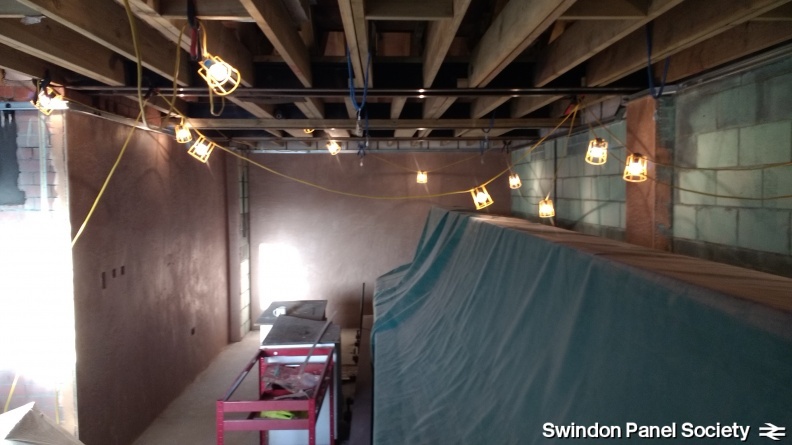 Thank you for your help – Swindon Panel needs you! Some of our plans for the next few weekends, which we hope you might wish to join in with! Work will be taking place on the front pathway to the building, including digging-out and levelling the ground from the front door of the building up to the main platform. No special skills are required, but a great deal of satisfaction is there to be gained from some therapeutic digging! We will also be continuing our wiring and soldering inside the panel. Our current work involves altering the ‘looping’ between the switches and buttons in the panel in order to deliver 24 volts to one side of each switch and button, in order that operating the button or switch delivers electricity to the simulator input. The civil engineering group will also be present and engaged in continuing work on the building, including door and window fitting. Painting work will be taking place inside the building to put a first coat over the newly-plastered walls. Soldering will also be continuing. 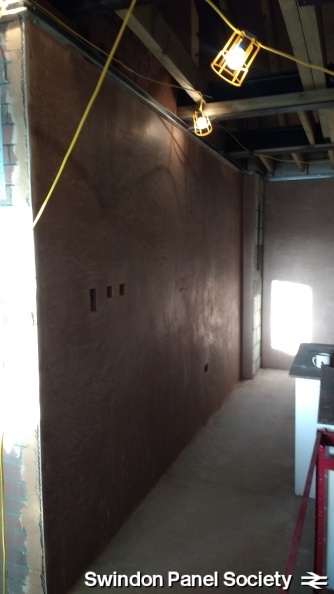 Plastering will be largely complete by this stage, and installation of shelving etc in the building will be taking place to move our main ‘stores’ into the panel room from elsewhere on the site. As well as completing any unfinished tasks from those above, we will be continuing with soldering work in the panel. By this stage we will be ready to start testing our 24v looping, so will be repeating a task we did a few weeks ago with lamps, which was to light them up one at a time for testing, which is to attach each switch in turn to a buzzer and then operate it to prove its electrical continuity. Are you a member of Swindon Panel Society yet? If not, there has never been a better time to join! If you are a bronze member, perhaps you might like to consider upgrading to Silver! The ‘when’ currently depends on fundraising, so if you’ve followed our progress with interest thus far, please consider joining the Society. There are two levels of membership, starting from just £5. You’ll receive a membership card, email updates, you can visit, and play with, the panel as much as you like when we are open (or even when we’re not as a silver member!). Silver members also receive our popular news magazine with many interesting reports and stories about the preservation work.